Minneapolis, MN, December 17, 2012…Microboards Technology Inc. announced a new disc publisher and autoprinter today. The G4 series features the same high-quality inkjet printing as its CX-1/PF-3 products, with a sleek design that builds on the G3, the previous generation of entry level publishers. The G4 has a fifty disc capacity and is design for a typical throughput of 250 discs per week. 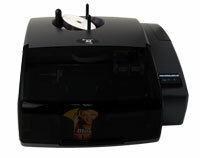 Full-coverage, full-color discs print at an average of 25 cents per disc which, combined with the low street price of $1,495 for the disc publisher and $1095 for the autoprinter, make the G4 a great value with a low cost of ownership. In addition, the G4 is available as a Blu-ray publisher or with an ISO-compliant recorder for critical archival requirements. “We anticipate that the G4 will meet the needs of a broad section of the disc publishing market." Says Westrum. "Given our long experience as the leaders in duplication and publishing hardware, we are confident that the G4 will be the standard for disc publishing as long as people need to print and burn discs." More about the G4 Publisher is available here. integrating, selling and distributing CD, DVD, and Blu-ray publishing solutions and supplies throughout the world. Microboards Technology serves the U.S. through its U.S. headquarters at: 8150 Mallory Court, Chanhassen, MN 55317.